There has always been so much talk and effort about turbos for the W8, which just isn't reality because of lack of room but there is plenty of room for a supercharger. Take a look at the PES kit for the V6 Passat, we just need someone to make a kit like that for the W8, which I seriously doubt will ever happen anytime soon. If you search on Google for VR6 supercharger there have been some people making there own kit out of with 3.8 liter E90 charger. The W8 is basically two VR6 put together (the W12 prototype, etc). It's just an idea to throw out to anyone crazy enough to try something. That crazy someone is not me. Perhaps, I see here that we'll need someone to test and program a new ECU map for the increased air flow; air/fuel ratio.. I've been thinking back of overboosting the power of this W8. I don't think this would been a very good idea. 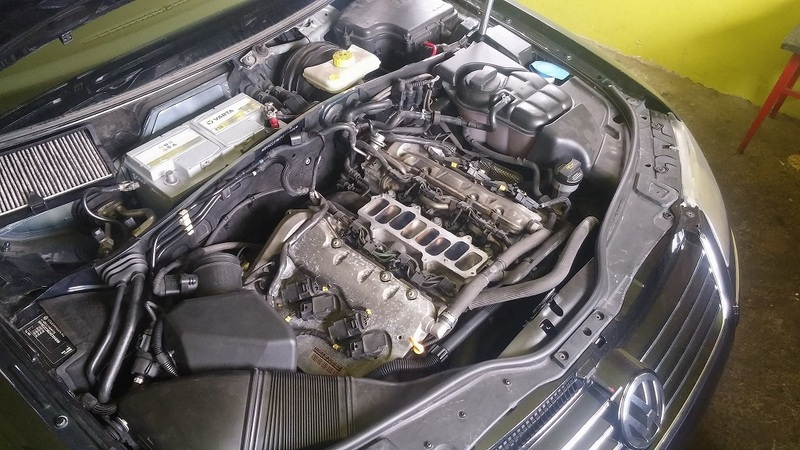 Rated 270 HP (SAE), it can been chipped to 300-325HP at the limit..
For having rebuilt many of those engines, I saw many connecting rods failure and crank seisure. Those connecting rods are very thin; 1/2" (12mm) wide only, transmitting 35HP/500cc of power for each cylinder. Compared to similar 500cc connecting rod, those are a lot wider (3/4" to 1") at the crank connection. Pushing too much power to those W8 connecting rods, heat and pressure will built-up, making the rods berings to fail. This engine design is already at it's limit with this 10.8:1 compression ratio. For this same reason, the W12 Phaeton, have this exact same 35HP/500cc per cylinder ratio, topping at 420HP. Sorry, I wanted to insert some pictures; it seems not to work? You have to upload them to a host, like http://www.imgur.com , and then link them here. Been thinking about this....Quite feasible to 3d print a manifold adapter to use either a roots or twin-charged style compressor. You can get used SVT/Cobra units pretty cheap from guys upgrading. High temp printable plastic is available now.